The chief Philippine prosecutor says he will be filing murder charges Friday against a scion of a powerful pro-government clan accused of leading the massacre of 57 people in the south of the country. Chief State Prosecutor Jovencito Zuno said he has instructed his staff to work overnight to be able to meet a 36-hour legal deadline for filing of charges against Andal Ampatuan Jr., who turned himself in Thursday. Ampatuan is the only suspect so far, accused of leading Monday's ambush on a rival candidate's family, supporters and journalists traveling in a convoy in southern Maguindanao province. Ampatuan has denied any involvement. The dead from Monday's massacre include the wife, family and dozens of journalists and supporters of a gubernatorial candidate who wanted to challenge the rival Ampatuan clan, which has ruled the lawless province of Maguindanao unopposed for years. Army Lt. Gen. Raymundo Ferrer says Andal Ampatuan Jr., a town mayor who allegedly stopped the convoy with four police commanders and dozens of police and pro-government militiamen, surrendered himself to presidential peace adviser Jesus Dureza in the provincial capital. He boarded a military helicopter to a nearby city, from where he will be flown to the capital, Manila, for investigation, Ferrer said. "The family voluntarily surrendered him and they agreed that he will be investigated," he said. Ampatuan's family denied the allegations of his involvement in the slayings. The military deployed tanks and truckloads of troops throughout the province under a state of emergency to hunt down the attackers and prevent retaliatory violence from the victims' clan. Police and soldiers on Wednesday found 11 more bodies at the site of the attack, bringing the death toll to 57. Six of the bodies were discovered in a large pit buried alongside three vehicles, and five were found in a mass grave a few miles off the main highway. The vehicles - a sedan and two vans - were crushed by a large backhoe that ran over and buried them, investigator Jose Garcia said. Ampatuan's surrender followed days of negotiations between his family and Dureza, apparently in a bid to prevent hostilities between the clan's followers and government forces. Interior Secretary Ronaldo Puno said he had warned the Ampatuan family they risked a military attack unless they turned over Ampatuan Jr. by midday Thursday. Ferrer said the area around the provincial capital was tense after troops disarmed about 350 pro-government militiamen loyal to the Ampatuans. The militia is meant to act as an auxiliary force to the military and police in fighting rebels and criminals but often serve as a politician's private army. The clan, which has ruled the province since 2001, helped President Gloria Macapagal Arroyo and her allies win the 2004 presidential and 2007 senatorial elections by delivering crucial votes. Arroyo came under intense pressure at home and abroad to seek justice for the victims of the massacre, with U.N. Secretary-General Ban Ki-moon and media and human rights watchdogs voicing their concern over the scale of the killings. The vice Mayor of Buluan township, Ismael Mangudadatu, after receiving death threats, sent his wife and relatives to submit his candidacy Monday when the convoy, including at least 18 journalists, was ambushed. Mangudadatu said four people whom he refused to identify told him Ampatuan Jr. was seen with the gunmen. Five police officers, including one provincial police chief, were relieved of duty and will be brought to Manila to face the investigation together with Ampatuan Jr., Ferrer said. Arroyo vowed justice for the victims and declared a national day of mourning. "This is a supreme act of inhumanity that is a blight on our nation," she said in a statement. "The perpetrators will not escape justice. The law will haunt them until they are caught." Few think she will be able to restore the rule of law in the impoverished region that has been outside the central government's reach for generations, and where warlords backed by private armies go by their own rules. Maguindanao's acting governor is Sajid Ampatuan, another son of former Gov. Andal Ampatuan Sr., the clan's patriarch. Human Rights Watch expressed concern that the administration's relationship with the family would hinder an impartial investigation. 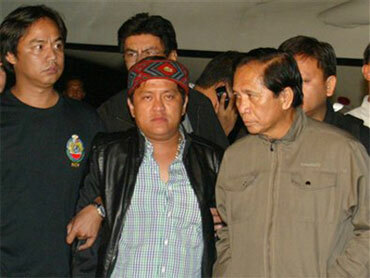 Arroyo's ruling party, in an emergency meeting late Wednesday, expelled Ampatuan Sr. and his two sons. Among the 18 dead journalists - the highest number of reporters killed in a single attack anywhere in the world - was Alejandro "Bong" Reblando, 53, a former Associated Press stringer. He was the most senior in the group of reporters. Reblando, who was based in General Santos City, was a staffer for the Manila Bulletin daily newspaper. He covered the southern Philippines for the AP from the late 1980s to the early 2000s, reporting on the Muslim separatist insurgency as well as local politics.